The children’s pool at Taman Wisata Indah Lestari Talang Kawo. Approximately 4 km south of the City of Bankgo is an interesting park that has a children’s playground, swimming pool, pond for fishing, as well as paddle boats. It also has a band platform on the the edge of the pond. In the Indonesian City of Bangko (Jambi Province), there is an interesting park that has an assortment of birds, as well as monkeys. The cost to enter the park is Rp6,000 ($0.60 USD). If you want to park your motorcycle it’s an extra Rp3,000 ($0.30 USD). The location of the park can be found by clicking this Wikimapia link. 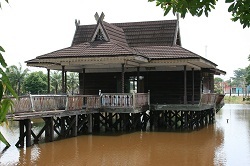 In the City of Bangko there is a bell tower positioned on the most elevated piece of land. This tower was inaugurated in November of 2000. Since that time the area has been a location where people visit to talk and observe the scenery. There is also a small soccer field located to the west of the building. To find the location of the tower, click this link. The park in the City of Muara Bungo, formerly known as Taman Kota, is now referred to as Bungo Cyber Park. This park was updated with the installation of a series of connections for laptop computers, and with this update the name of the park was also changed. Picture to the Right: This is a depiction of a rafflesia flower, the largest known to man. 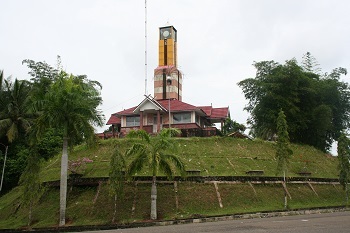 The City of Muara Bungo has several of these monuments in the center of several roundabouts. These flowers are said to be located not far from the city, though we have yet to be able to locate one. 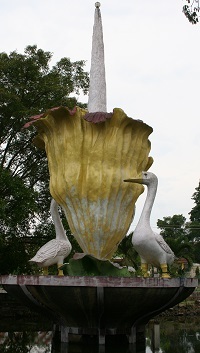 The monument also portrays two geese (Angso Duo), which is linked to a legendary story from the Jambi Province. 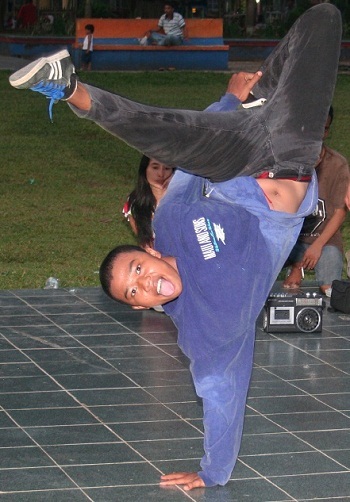 Member of the JBD Squad in Muara Bungo. During a recent visit to Muara Bungo we spent a leisurely evening at a local park named Taman Pusparagam. The park was previously a soccer field, and at that time it was called Taman Semagor. Though the park is no longer a soccer field, and the name was changed, most of the people in the city still refer to the park by its former name—Taman Semagor. The park has four rock climbing walls, one huge inflatable attraction for children, as well as a small train. Surrounding the park are numerous food vendors which sell a wide assortment of traditional Indonesian food. This is a small and simple park in the City of Muara Bulian (Jambi Province of Indonesia). It’s an exceptionally nice park for local people who want to spend an hour or two with their children, or a place for teens to hang out. It’s an exceptionally clean park (absence of trash), but with no unique attraction we wouldn’t recommend it for tourists from outside the area. The park’s exact location can be found by clicking this link. Below is a video we made of the park. 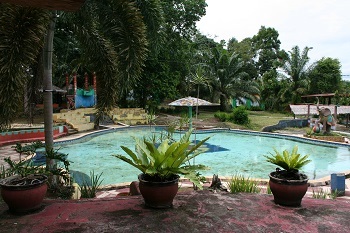 Seven kilometers to the south of Muara Bungo (at this location) is a new water park that was opened August 20, 2011. This is quite possibly the largest and nicest water park on the southern part of the Island of Sumatra. The park is owned by a former Muara Bungo Bupati–Zulfikar Ahmad. That man also owns the Semagi Hotel, as well as several other businesses.